Some crocheters enjoy working with a limited color palette and have no interest in exploring different colors while others have an almost paralyzing fear of experimenting with color. If you fall into the latter category, you already know that color has a major impact on the style and mood of your crochet project, but maybe you need some support in venturing into new color territories. Here are five tips to get you started along a colorful crochet journey. One way to step outside your personal color comfort zone is by using tried and true combinations of yarns recommended by designers and bloggers known for their color sense. Sarah London, Lucy from Attic 24, Kathy Merrick, Leonie Morgan, and Stacey Trock are a handful of designers and bloggers known for their love of color. Take a look at their work and draw your inspiration from their finished items. Several websites offer daily, weekly or seasonal color palettes that can inspire your next crochet project. Some favorites are Color Collective, a blog featuring color palettes drawn from images; Colour Lovers, a community that shares color inspirations and palettes; Design Seeds, a website that offers color inspiration posts and also provides the ability for readers to search through palettes by color value and theme; and Pantone, which shares seasonal color reports that predict fashion and home décor trends. Pick and choose colors from any of these palettes to get a stylish and put together feel. If you have a photograph that you find inspiring or have seen an image online with colors that appeal to you, a web-based palette generator can help you separate the individual colors so you can match them to solid color yarns. Color Hunter is one such website. 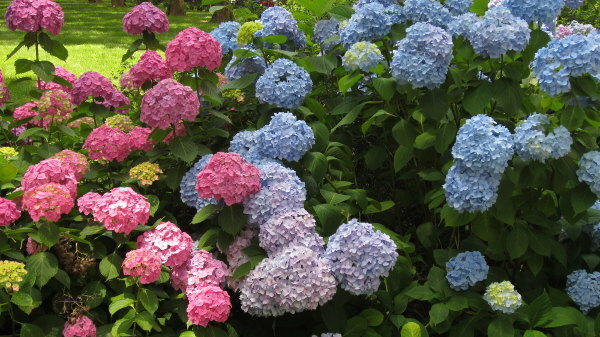 I took a photograph of these colorful hydrangeas a few years ago, and Color Hunter generated this palette. Choose a solid color yarn that speaks to you, and generate a palette of colors to combine with it. Color Scheme Designer allows you to select any color in the rainbow and then generates a color scheme with options for mono, complement, triad, tetrad, analogic or accented analogic colors. You can also put yourself in the hands of the yarn company, and pick a multi-colored yarn for your next crochet project. In addition to the variegated and self-striping yarns available from the large yarn companies, several independent dyers, such as Dragonfly Fibers, Miss Babs, and Space Cadet Creations, are known for their beautiful color combinations. This option has the added benefit of minimizing yarn changes, and thus reducing the number of yarn tails you have to weave in at the end of your project. With these easy tips, you should be ready to embrace new colors in your next crochet project. Help! 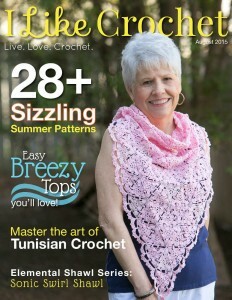 How do I read a crochet pattern?